Beer the Show is a local website dedicated to exploring and enjoying all things related to craft beer. 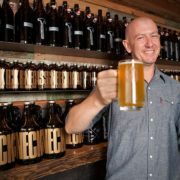 Known for showcasing some of the great stories coming out of the Vancouver beer scene, the thirsty Beer the Show crew has over 100 years of combined television experience and even more experience drinking craft beer. Sufficed to say, when they called us up looking to do a story on our brewery tours, we were humbled and excited to help! We invited the Beer the Show crew to come along on one of our popular Saturday behind the scenes tours and join in on the fun. Not only did they capture some of the day’s highlights, they also got to speak to a few brave beer drinkers and ask them about their brewery tour experiences. Check out the video below to watch the day unfold!